For the ever-growing Big Apple fan base of the musically gifted young Anderson Twins (Peter & Will), it will come as no surprise that they are now in the midst of another New York triumph with their current, month-long celebration of four of America’s legendary composers. 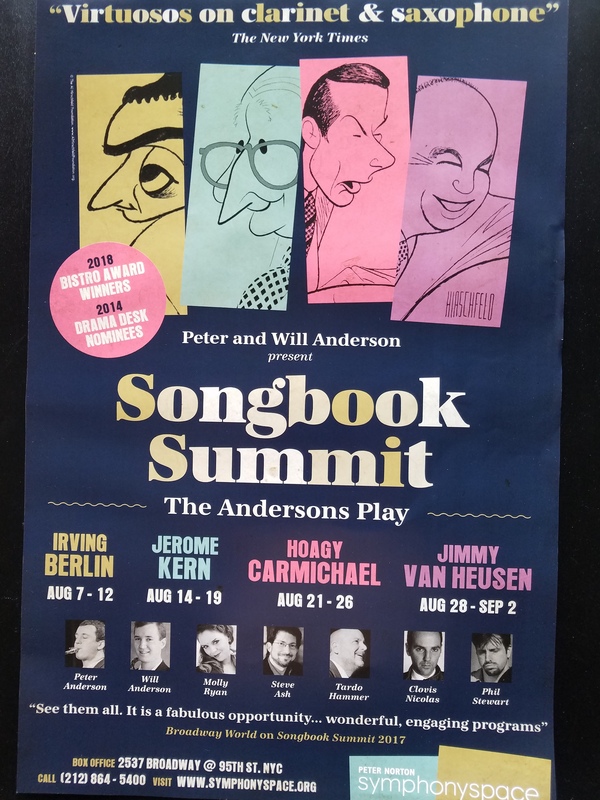 Becoming an annual event, this 2018 edition of their SONGBOOK SUMMIT (being presented in the intimate Leonard Nimoy Thalia Theater of SymphonySpace), is currently showcasing the music of Jerome Kern (thru AUG. 19th with performances today at 4 & 7pm, tomorrow at 2 & 5 pm), Hoagy Carmichael (AUG 21-26), Jimmy VanHeusen (AUG 28-Sep 2), and, just completed, Irving Berlin (AUG 7-12). To whet New York musical appetites for what is to come, it is that recent latter concert that I report on here. A colorful and amusing Al Hirschfeld drawing of Irving Berlin at the piano greeted the arriving audience, and would be the first of many on-screen projections of video clips, photographs, and even additional drawings made possible with the permission of the Hirschfeld Foundation. The joyful 90-minutes (no intermission) got underway as the talented back-up trio took to the stage with Clovis Nicholas on bass, Phil Stewart on Drums, and Tardo Hammer on piano. (Some performances feature Steve Ash on piano & Neal Miner on bass). They were quickly joined by the multi-talented and identical twins, Julliard graduates who would bounce freely between assorted instruments throughout the program. 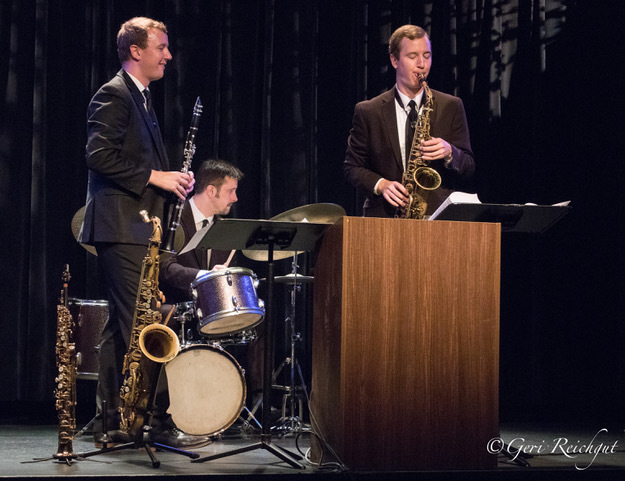 Known for their extraordinary interpretations of classic jazz compositions, both gents are virtuosos on clarinet, while Peter would dazzle on both tenor and soprano sax, and brother Will is a master of flute and alto sax. 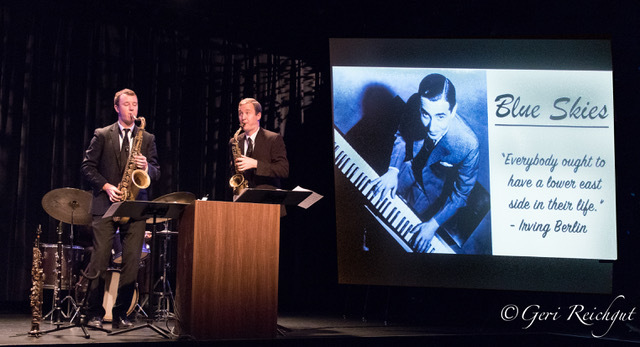 The program format continued to follow the successful style of previous Anderson concerts I have reviewed at Manhattan’s 59E59 Theatre complex in midtown. Peter & Will Anderson perform as Irving Berlin looks on. Reflecting on Berlin’s long life (1888-1989), and his some 1500 song compositions, an informative historical narration punctuates the show’s musical numbers, as do the assorted visuals. One amusing montage flashed brief clips including Edith Bunker sweetly singing, “Won’t You Play a Simple Melody,” a Star Trek scene featuring, “Blue Skies,” a rare childhood home movie of future stars, Eli and Peyton Manning tossing a football around to the tune, “Anything You Can Do (I Can Do Better),” and Ethel Merman joining the Muppets for a rendition of that same song. 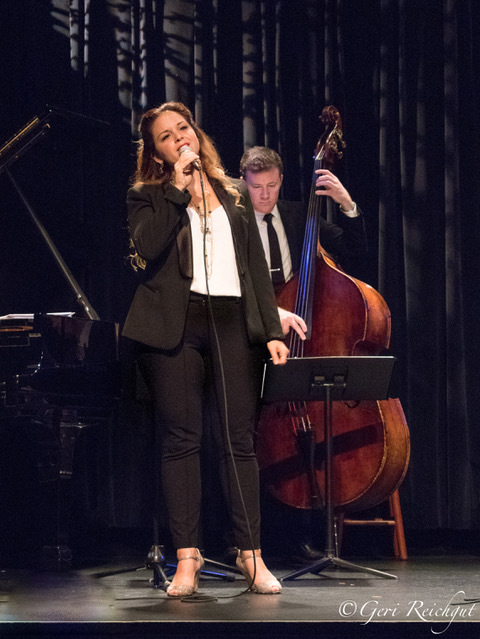 Next, the concert moved up to an even higher level as lovely featured vocalist, Molly Ryan, came to the stage to deliver a fresh and lilting interpretation of, “Blue Skies,” accented by a solid jazz duet from the twins, and peppered by crisp piano from Mr. Hammer on the keys. The beautiful Miss Ryan, golden tresses tumbling down her back, shows a smooth and gentle vocal side just as endearing as her glowing smile while singing, “Isn’t it a Lovely Day.” The purity of her voice could have been etching fine crystal during a sublime, “I’ve Got My Love to Keep Me Warm,” that featured more great spots from the twins, great pacing on drums, and pulsing bass that guides Ryan to a rousing vocal conclusion. As Will Anderson continues the informative narration, we learn that Berlin could neither read nor write music, and could play piano only in the key of F#, but a specially designed piano allowed him to change keys by simply shifting a lever below the keyboard. But Berlin’s long life was not without its tragedies, as his first wife died just 6 months after their marriage, and in 1929 he would lose his fortune in the stock market crash. His second marriage produced a front page 1926 scandal in the New York Times when the Jewish Berlin married the love of his life, Catholic, Ellin MacKay. It was the beginning of a happy union that would last for 60 years, though their first child would sadly die in infancy. Sad moments notwithstanding, Berlin’s body of work is a joy to behold, and the Andersons really know how to put it across. 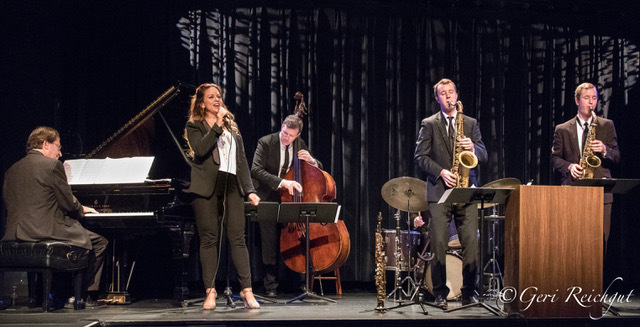 Musical delights seemed to tumble one upon another as the show continued with such classics as a “What’ll I Do?” that had a richly tender pairing of piano and clarinet that was dreamy, warm and reflective. With sax and clarinet the brothers joined for a fast paced, “Let’s Face the Music and Dance,” highlighted by jazzy moments from the trio. Berlin’s Hollywood musical years are nicely sampled with fascinating video clips of Astaire, Garland, Jolson, Harpo, Crosby, and even Donald O’Connor and Marilyn Monroe. Then Miss Ryan returned to bring her remarkable vocal purity to a bubbling rendition of the song, “Always,” the musical wedding gift Berlin gave his bride in 1926. 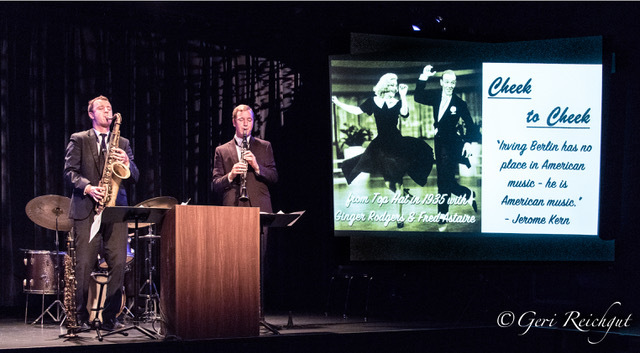 For the tune, “There’s No Business Like Show Business,” the twins brought dueling saxophones to their rapid-fire launch of the song that shot Ethel Merman to fame in the 1946 hit, Annie Get Your Gun. But the song soared to an even higher level when Ryan joined in on the vocal and knocked it out of the park like it was her own personal anthem. Next, we were treated to yet another set of great video clips, this time from countless musical TV appearances by stars like Sinatra, Nat King Cole, Bobby Darin, and Count Basie. The show offered more education as we learned of the patriotism, heart and generosity of Irving Berlin with the support he gave the Red Cross, the Girl and Boy Scouts, not to mention the three World War II years he toured selling war bonds with his 1942 musical, This is the Army, which soon became a hit film of the same name. His perennial classic, “White Christmas,” won Berlin the Academy Award for Best Song of 1943. When our cast returned to the stage for the musical complexities of the tune, “Puttin’ on the Ritz,” it was clear they were up to the task, and Mr. Hammer followed with a lush piano solo of “How Deep is the Ocean?” Finally, with Ryan anchoring the sensational company finale of, “Anything You Can Do, I Can Do Better,” I realized it was the perfect finish for this stellar group of musical talents. Nobody could have done it better! This entry was posted in BroadwayStars.com, Concert Reviews, ThePeoplesCritic.com and tagged Al Hirschfeld, Anderson Twins, BroadwayStars.com, concerts, Hoagy Carmichael, Irving Berlin, Jerome Kern, Jimmy Van Heusen, Leonard Nimoy, Molly Ryan, music, Off Broadway, Peter Anderson, Symphony Space, ThePeoplesCritic.com, Will Anderson. Bookmark the permalink.